Wheeling, West Virginia, (population 31,400) is located on the Ohio River, in the northern tip of the state. The town was founded in 1769 and was chartered as a city in 1836. The Historic National Road, the nation’s first federally funded interstate highway, was completed from Cumberland, Maryland, to Wheeling in 1818, and that, combined with the B&O Railroad and the river, created a thriving industrial center in the city. As a result, Wheeling contains the state’s most significant concentration of 19th century commercial and residential architecture. 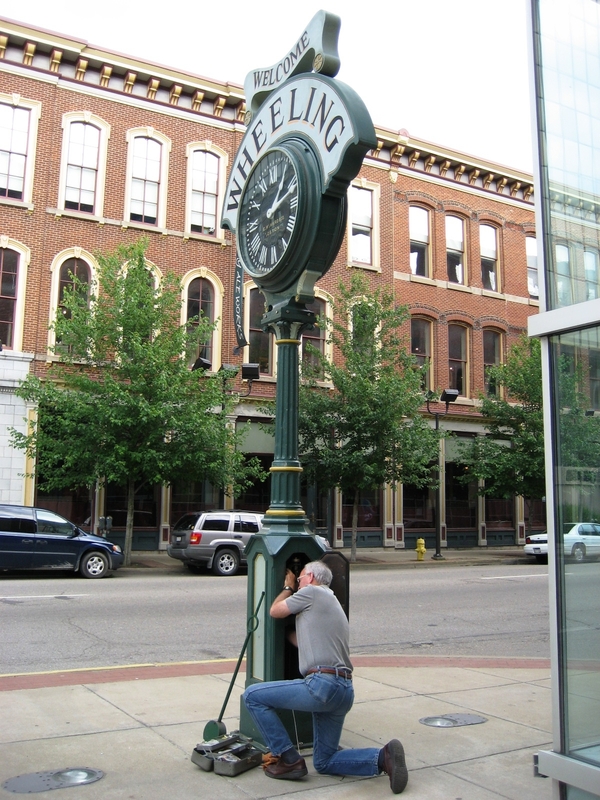 Wheeling became known as “Nail City” in the late 19th century and led the country in nail production for many years. Throughout the 20th century, Wheeling produced steel, glass, pottery, textiles, and tobacco. The labor movement also thrived in the city, which is the location of the nation’s oldest central labor council. Today, Wheeling persists, though the community has been adversely affected by the loss of industrial jobs. The city seeks to recycle and restore its historic assets, using its river location and small city atmosphere to attract new business. Recently, four large, abandoned buildings (contributing properties on the National Register of Historic Places) have been rehabilitated and now house business and educational concerns. Wheeling’s West Virginia Independence Hall, a National Historic Landmark, is where the decision was made to break away from Virginia and form a separate state, allied with the Union, during the Civil War. The Wheeling Suspension Bridge, another Historic Landmark, is the oldest continuously operating suspension bridge in the world. Wheeling’s ethnic diversity is celebrated each year with a number of fairs: the Grecian Food Festival each summer; Mahrajan, the Lebanese heritage festival in August; the African American Jubilee in June; and the Annual Wheeling Celtic Festival in March.